The 10 Best Pho Restaurants in Wisconsin! Pho is a Vietnamese noodle soup that that contains a steamy broth, rice noodles, spices, and traditionally either chicken or beef. At these excellent Wisconsin restaurants, you’ll find the popular dish served up authentically and traditionally. Here are our favorites. Dine in or take out at Pho Nam Noodle House in Madison. Their warm beef pho will hit the spot if you are looking for a new take on pho. Its lengthy cook time allows for the beefy broth flavor seep in with countless spices to bring you the most satisfying dish on the menu. You’ll find traditional Vietnamese foods at Pho Viet in Milwaukee, Wisconsin. They have the very best pho in Milwaukee paired with fresh veggies and ingredients. Pho Viet offers almost 20 different pho dishes in three different sizes. The best part? You can customize with by adding extra meats, noodles, and vegetables to your tasting. The masterminds behind the Saigon Noodle traditional have been serving up Vietnamese favorites since 1983. They promise to only use the freshest authentic ingredients based on their slogan, “Quality over quantity.” If you love pho take the time to work your way through their pho menu with 10 different tasty dishes. Egg Roll Plus Hmong Restaurant is a locally-family owned Asian cuisine food joint. This laid-back eatery is serving pho, lab, and curry marinating in a variety of herbs and spices. Stop in for great deals on pho favorites. They’ve even been voted “Best of the Chippewa Valley” for Asian food and appetizers. Hue is a casual Vietnamese restaurant offering a relaxing lounge and lengthy menu. Try any one of their six pho options like the chicken pho. Make it an extra-large pho for just $4 more! Enjoy a variety of authentic Vietnamese cuisine including their famous pho dishes. Stop in for lunch or dinner and try anyone of their 17 pho noodle soups. We recommend their Pho Combo House Special served with bean sprouts, basil, lime, hot green peppers, with sliced beef, meat beef, brisket, tendon and tripe. The Pho Lodge in Green Bay is the perfect place to pick up a delicious dish of pho in the Fox Valley. This pho is served with the freshest ingredients and is sure to be some of the best you’d tasted. Just a friendly reminder to bring your cash as they do not take credit cards! Plia’s Kitchen served Southeast Asian cuisine right in the heart of Green Bay. Try their Pho Deluxe served with tender noodles, double steak, shrimp, beef meatballs, and tripe in a frothy beef soup. You’ll love the basil, jalapeno, bean sprout, and lime combination that the Deluxe Pho dish offers. Pho Cali is loved by many, so naturally there are two area locations—Milwaukee and West Allis! Their menu offers nine different pho options. We recommend the pho brisket and beef ball. It’s a fan favorite at Pho Cali. Even better—choose between a medium or large portion option. Pho 75 located in Wausau is Vietnamese restaurant loved by many locals in the area. They are known for their great pho which can be served in four different bowl sizes. 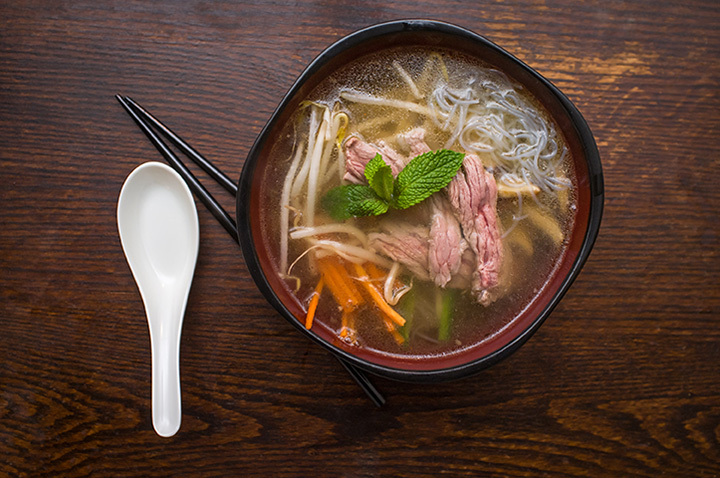 If you are looking for tender noodles, warming broth, and the tastiest of meats stop in Pho 76. Always a must before leaving Wausau! My favorite pho place.